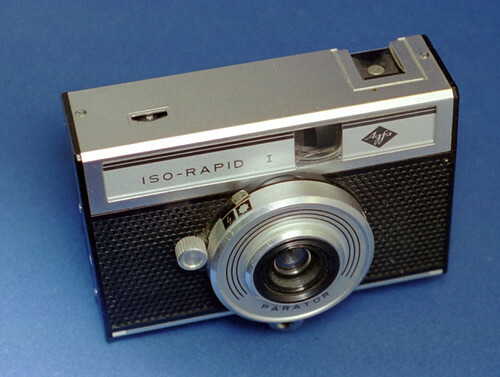 The Agfa ISO-RAPID I was an all-mechanic viewfinder camera for Agfa's Rapid film system. It has a fix-focus lens in a Parator shutter with release lever. Two settings are selectable: sunlight and flash. On top of the brick-like camera body are an exposure counter and a hot shoe for an electronic flash. A thumb-wheel in the camera back serves for cocking the shutter and advancing the film.